The arrangement of different kinds of layered rocks is a powerful tools used by geologists to determine relative ages and processes that emplaced the rocks. How the rocks are positioned relative to each other is called stratigraphy. When rocks are horizontally layered, then the law of superposition states that for any given rock layer, rocks below it are older and those above are younger. This is because rocks are laid down as a sequence with the oldest rocks deposited initially, followed by younger rocks deposited above. If processes like mountain building, faulting, or erosion later disrupts the rocks, then this relative age determination may no longer be used. The geologic contacts between the rocks will show which one of these processes has disrupted the horizontal sequence and can be used by geologists to piece together what was the original stratigraphy. Figure 1. 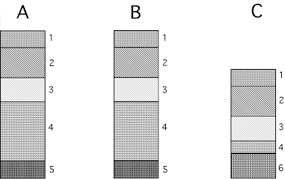 Illustration of stratigraphic vertical columns at three different locations (A,B,C). Figure 1 illustrates vertical stratigraphic rock columns from 3 different locations. Let's say you are driving to a friend's house several miles away. Near you house you see out your window a roadcut where you can see the rock layers in A. You notice 5 different rock layers in the exposure. The top layer 1 is the youngest because it is on top and rock layer 5 at the bottom is the oldest layer. After driving 5 miles, you see another exposure of rocks at location B. All the rocks look the same and are the same thickness as those you saw by your house. After driving another 10 miles, you notice another exposure of rocks at location C. You still see five different rock layers, but something has changed. Layers 1-3 look the same as you saw back at locations A and B, but now layer 4 is much thinner and there is no layer 5. Instead, there is a new rock layer 6. One possibility is that layer 4 was deposited as a thinner unit and layer 5 was never deposited here. This may be the case if 4&5 are lava flows and the lava didn't flow this far out or became thinner at this distance from the source of the lava. Another possibility is that the rocks were deposited here but subsequent erosion of the rocks, such as by wind, removed all of layer 5 and much of layer 4. If this is the case, then the geologic contact between layer 4 and 6 represents an unconformity, a term geologists use to describe a surface of erosion or non-deposition that separates younger rock layers from older rocks. Layer 6 may be underneath layer 5 at locations A&B but you can't see it in the exposures at these other locations. Figure 2.Illustration of unconformities in layered rocks. Although Mars doesn't have exposures of rocks produced when making roadcuts, there are great views of layered rocks on Mars that we can see in canyon systems, like Valles Marineris. There are also impact craters that create big holes in the ground and the walls of the craters may have layered rocks. Faults and erosion by the wind can also expose layers. By using images from HiRISE, geologists will look for layered rock and try to correlate one rock layer at one location to those seen at a different exposure of layered rocks. As the rock layers change in their morphology and/or thickness, geologists can propose processes that could have deposited or removed the rock layers at different locations. If the layers are thought to have been deposited by water, then the larger of an area they can be traced across, the larger the body of water that emplaced them. If they are volcanic rocks, then this means the eruption of lava lasted a long time or was very voluminous to cause the lava flows to cover a large area. Stereo images taken by HiRISE will be very helpful in cases where the layered rocks are exposed vertically. By using stereo images, scientists can see if layers slope or tilt in one direction, which could be due to how they were originally deposited, or by subsequent movements that disrupted the layers. Geologic contacts seen in HiRISE images can be used to determine if unconformities have affected the rocks. In Figure 2, there are 8 different rock layers seen in this exposure. 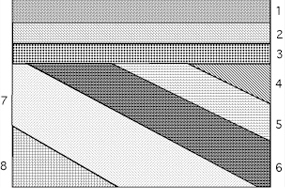 Layers 1-3 are horizontal while layers 4-8 are tilted. The contact between the horizontal layers and the lower tilted layers indicates an unconformity where the lower, older layers got tilted, then eroded down to a horizontal surface, followed by deposition of layers 1-3. Processes such a faulting, perhaps associated with mountain building, can create this kind of tilting and unconformity on Earth. On Mars, impact craters and faulting are possible processes that may have caused similar uplift and unconformities with layered rocks.